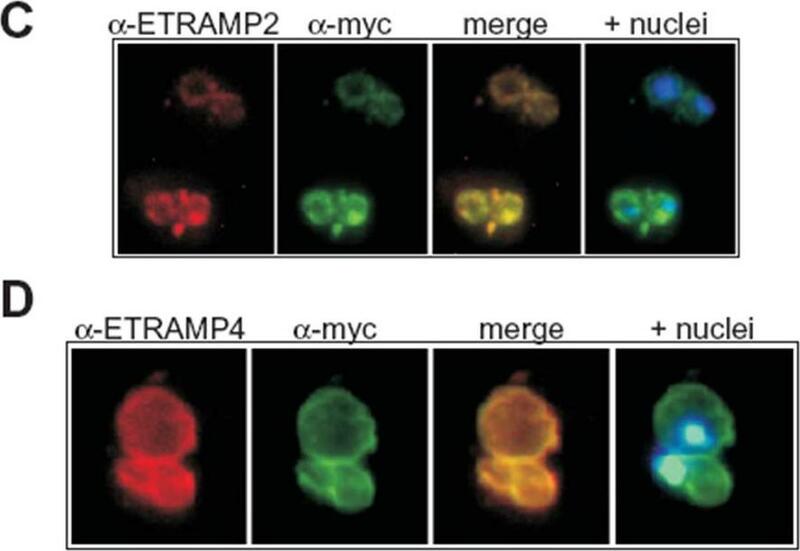 Transgenic expression of myc-tagged ETRAMP2 and ETRAMP4. 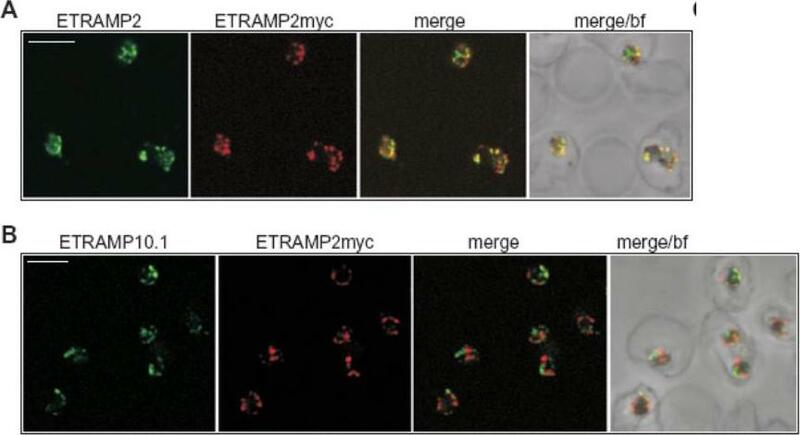 Immunofluorescence analysis in acetone-fixed IRBCs: the tagged transgenes detected via the myc tag colocalize with the respective chromosomally derived ETRAMPs in a typical peripheral staining in the transfected parasites D10E2myc (C) and D10E4myc (D). C shows two IRBCs, each with a double infection of ring-stage parasites and D shows a double infection of trophozoites. Hoechst was used to stain the nuclei. Immunofluorescence analysis with an anti-myc serum showed a circular staining pattern in acetone-fixed D10E2myc and D10E4myc parasites (C and D), which is typical of the ETRAMP staining pattern seen with anti-ETRAMP serum in untransfected parasites. ETRAMPs are seen in focused areas of the PVM.Spielmann T, Gardiner DL, Beck HP, Trenholme KR, Kemp DJ. 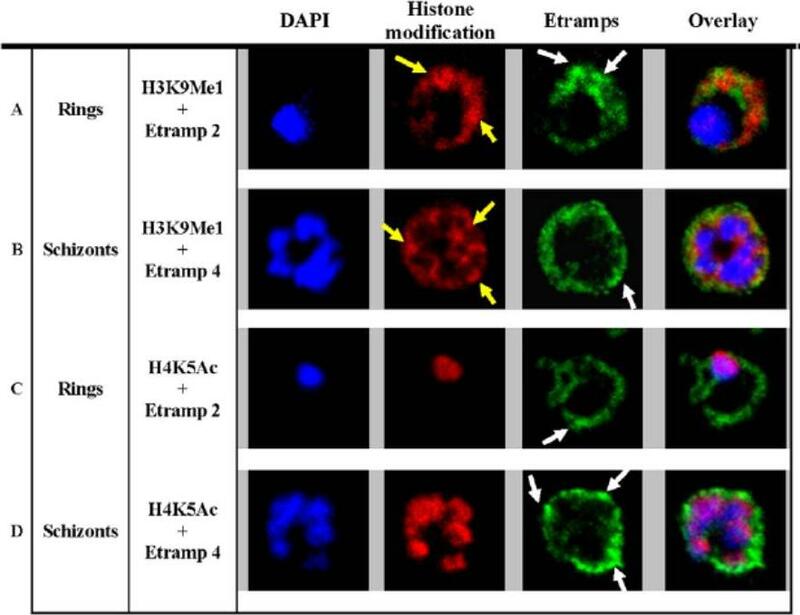 Organization of ETRAMPs and EXP-1 at the parasite-host cell interface of malaria parasites. Mol Microbiol. 2006 59:779-94. Colocalization of ETRAMPs with EXP-1 and SERP. The first image in each set shows ETRAMP labeling (green, FITC), the second Texas-Red-labeled SERP (A) or EXP-1 (B–F), and the third image represents the merged picture. The fourth panel in B and C depicts the merged picture, including nuclear staining (DAPI). (A) Confocal microscopy analysis of SERP and ETRAMP4 colocalization in schizont stage parasites (dried and 1% formaldehyde fixed). The ETRAMP4 signal seems partially detached from the PV content (arrow). (B and C) ETRAMP4 and EXP-1 localize to dots, probably representing vesicular structures that are detached from the PVM (E) or seem connected to the PVM (F). Dots are indicated by arrows. (D and E) Fluorescent microscopic analysis of ETRAMP and EXP-1 costaining of a ring-stage parasite displaying an even circular pattern (D, 0.1% formaldehyde-fixed IRBCs, ETRAMP10.1) or a beads on a string pattern (E, unfixed IRBCs, ETRAMP2). Yellow color shows regions of overlap (arrows). This indicated that ETRAMPs and EXP-1 localize to different regions of the PVM.Spielmann T, Fergusen DJ, Beck HP. etramps, a new Plasmodium falciparum gene family coding for developmentally regulated and highly charged membrane proteins located at the parasite-host cell interface. Mol Biol Cell. 2003 14:1529-44.